If PR pros want to regain their budgets and elevate the profession once more, they need to adopt a systematic approach to measurement and demonstrate their contribution to achieving business goals. Modern PR pros know they are bringing value to the business — however, proving that value has been a challenge, at least until now. Most comms pros today turn to coverage metrics like earned media clips and social shares, likes and followers for lack of a better data story. While these metrics help companies understand general brand awareness, they can fall short when it comes to tying performance back to specific business outcomes. 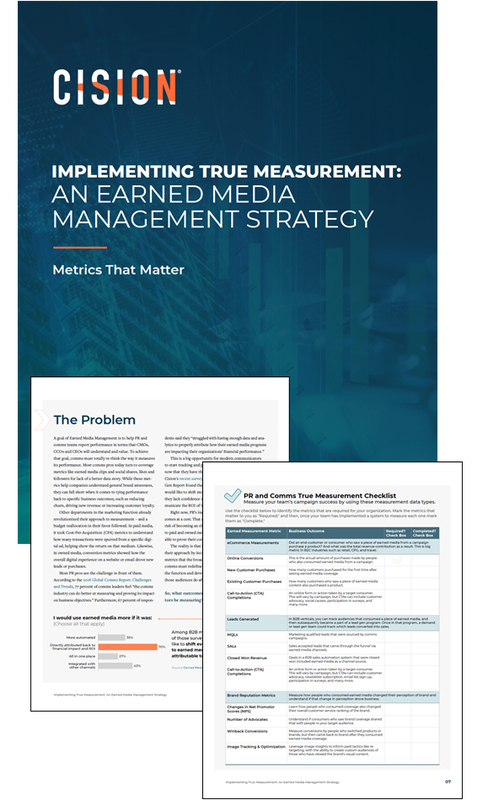 True measurement provides a new framework for PR and comms teams to showcase the effectiveness of their campaigns. It is predicated on the idea that measurement should be based on both the quality of coverage, as well as how that coverage drove specific business outcomes. How to identify the current problem with earned media measurement. A new approach: all about true measurement. The measurement framework CMOs expect from comms teams. How to achieve True Measurement. If you're ready to become a modern communicator and demonstrate the true value of earned media, download the whitepaper today!